Sewing for Easter is one of my most favourite holiday pastimes! And with Easter falling at the end of our Autumn school holidays this year, I feel like I’ll have even more time to make some really special gifts. Easter, for us, is all about bunnies. There’s just something about them. I’ve always loved them. But ever since my little Coco decided she wanted a bunny themed 3rd birthday party, they’ve been a very big part of our lives! They form a large part of our decorating (you can see last year’s themed entry here). And they definitely take over the sewing too! This tea cup bunny was a gift from my sister-in-law for my birthday. She watches over me intently while I sew. I love her here on my Hettie Hexie Mini Quilt. And she loves being a part of the Easter fun. Read on below for some great Easter sewing ideas and links to patterns, tutorials and more. 1. The Bitty Bunnies are a favourite in our house. These cute felt bunnies are teeny-tiny and come with their own carrot shaped sleeping bag too. They’re quick to sew and fun to make. And because the pattern is an instant download, you can get started right away! 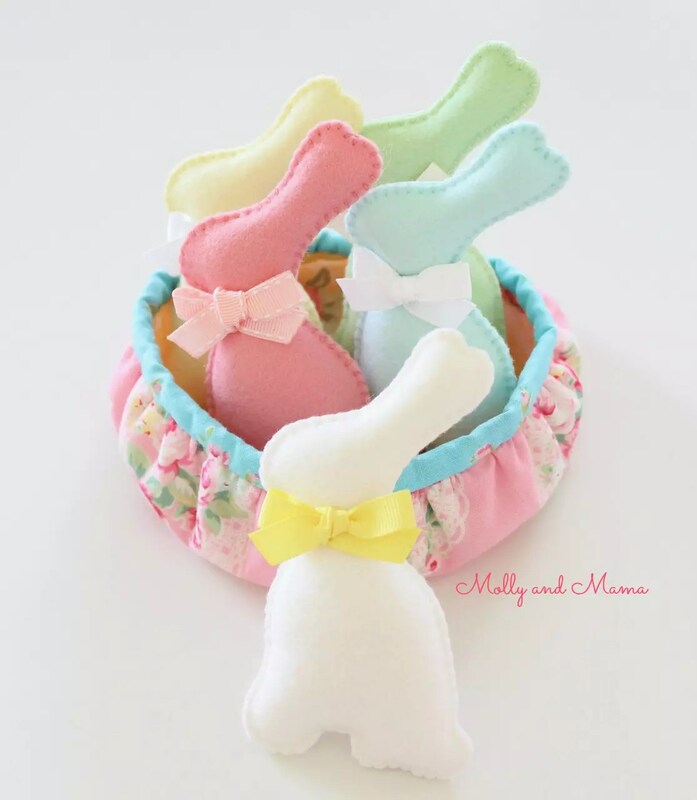 Read more about the Molly and Mama Bitty Bunnies HERE. 2. Another popular PDF pattern is the Brilliant Bunnies Appliqué template which is perfect for all your Easter embellishing! The pattern comes with two different outfits and accessory options too. Cute, huh? 3. My favourite Easter make for this year is the Darling Bunny Bag. You might remember the Darling Daisy Bag that I designed for One Thimble sewing magazine last year? For those that celebrate Easter during Spring time, this little bag would be perfect for egg hunting. However, I have also made a pattern hack based on the Darling Daisy Bag pattern especially for One Thimble too. It’s also perfect for Easter and it’s a free bonus tutorial. I just love how it turned out! 4. A few years ago Tickle the Imagination magazine featured my Easter collection. It is still one of my proudest achievements to date! (Head to the blog post to see all the stunning photos.) Part of the feature story was a free tutorial for these simple felt bunnies. I’ve seen lots of them popping up on Instagram. 5. Are you the chief Easter Bonnet Decorator at your place? An easy way to add Spring embellishments is to create felt flowers. These are perfect on a hat, wreath, in an arrangement, and also for hair crowns and accessories. The Coco Flower Crown pattern gives you the templates and instructions to make a whole range of different flowers that will have you adding blooms to everything. Another free tutorial is the Bunny Appliqué with the fabric yoyo tail. She’s terrific for t-shirts, tea towels and mug rugs too. Do you have a favourite Easter pattern, or project that you make? I’d love to hear all about it!